6/14/2007 - "There are no Nationalities in Romania?" The American Hungarian Federation Co-Hosts Lecture by Bishop Arpad Szabo from Kolozsvar... The Federation and the Hungarian Reformed Federation of America (HRFA) sponsored a presentation by Dr. Arpad Szabo entitled "In Europe, but . . ." at the HRFA Kossuth House. Bishop Szabo is the head of the Unitarian Church in Romania and is in the United States to attend the General Assembly of the Unitarian Universalist Association. The Federation’s program was the latest in its series of lectures relating to Central and Eastern Europe. Bishop Szabo said that in 1989 Hungarians dreamt of European Union membership but that reality is somewhat different. The EU initially urged Romania to respect human rights and to return confiscated properties. These urgings were merely recommendations and when Romania became an EU member, Brussels signaled that it would not interfere in internal affairs. Romanian society is divided. Some were able to parachute into the new society while others have become poor. There is considerable tension between the two groups. Moreover, the former feel and act as if they are above the law. This attitude carries over into politics in Romania. Corruption, always present in Romania, has gotten to the point where even the EU has spoken up. Globalization also endangers the Hungarian community and traditions. Foreigners, especially the Dutch, are purchasing large tracts of land in Transylvania. Moreover, Romanians are engaged in a building spree that encourages additional migration of ethnic Romanians to Transylvania, thereby further diluting the Hungarian population there. The situation is becoming hopeless. Other developments undermine Hungarians, such as the destruction of values and the physical traces of Hungarian presence in Romania, such as architecture and cemeteries. The Communist destroyed the middle class and with it middle class, civic values. Transylvanian culture and literature is also endangered, with little prospect of assistance from the EU. Romanian politics is contentious. Nonetheless, all parties scapegoat and blame the Hungarians for Romania’s ills. This scapegoating will never end because of the bad conscious and fear felt by the Romanians who know they received more than would have been justified by any principle. The present Hungarian government has severely cut back on assistance to the Hungarian community in Romania. [NOTE: with few exceptions, including the Federation and HRFA, this issue is not publicly raised by organizations here.] It’s not in this Hungarian government’s interest to address the needs of the Hungarians living as minorities. Even the U.S. ambassador to Bucharest shockingly declared that that there are no nationalities in Romania. The Rev. Arpad Szabo of Romania is Bishop of the Unitarian Church of Romania. The Unitarian Church was founded in 1567 in Transylvania, then an organic part of Hungary. Transylvania was transferred to Romania by the Treaty of Trianon following the First World War. There are currently over 80,000 Unitarians in Rumania. Bishop Szabó was born on April 15, 1935 in Petreni, Romania. He attended the Unitarian high school in Cristuru Secuiesc, which in 1948 was taken over by the state. He served as secretary to the Rumanian Bishop in Koloszvar (now Cluj) from 1958-1965. From 1965-1976, he served as minister of the Koloszvar Unitarian church. In 1974 he received a Th.D. degree in New Testament studies from the Protestant Theological Institute and became a full-time professor, teaching Old and New Testament for the Unitarian theological students. 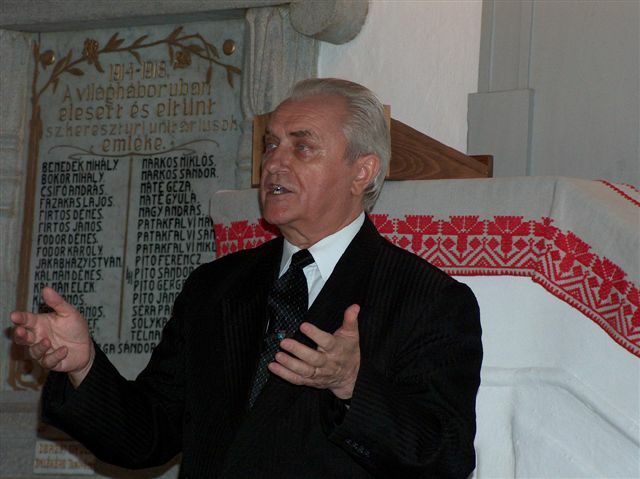 Dr Szabó studied at Meadville/Lombard Theological School (Chicago, USA) in 1977-78, where he had the opportunity to make acquaintance with many North American Unitarian Universalists, and served as Rector of the Protestant Theological Institute between 1990-1994. He has received honorary doctorates from the Protestant Theological Faculty of Montreal in 1989 and from Meadville/Lombard Theological School of Chicago in 1994. In December 1996 he was elected by the Supreme Consistory as the 30th Bishop of the Unitarian Church of Rumania. Bishop Szabó has been married since 1961 to Magda Fülöp, and they have a son and now two grandsons. He was a key leader in keeping the Unitarian faith tradition alive under the tyrannical regime of Nicolai Ceaucescu, who was finally overthrown in late 1989.